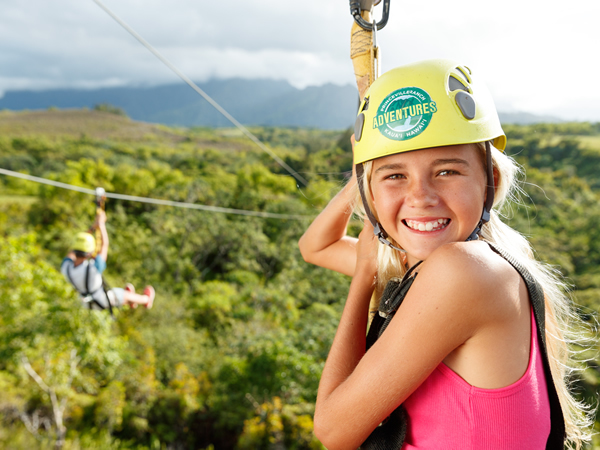 The Zip N Dip with Princville Ranch Adventures is a Kauai Zipline Adventure combines the thrill of sailing through the air while getting a bird’s eye view of a Hawaiian jungle paradise. 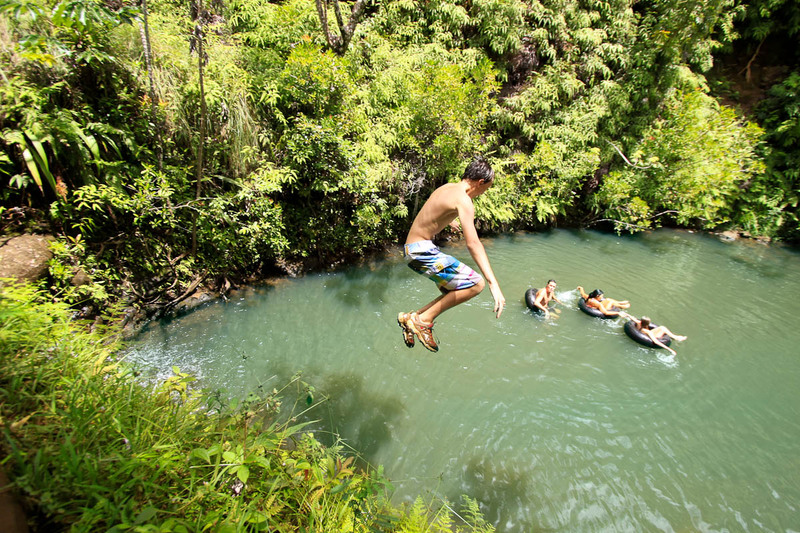 The Princeville Ranch Adventures Zip N Dip Expedition includes 9 picturesque ziplines, 1 suspension bridge, and an hour at a very deep hidden swimming hole with a small waterfall. At the swimming hole you will enjoy a delicious lunch, swimming, jumping, and floating on inner tubes. This is one of the Kauai Activities adventure of a lifetime! First we harness up and take a short ride to the trailhead. Clip in and soar like a bird over spectacular valleys and streams as you embark on a series of 8 zipline crossings. Kauai Zipline Adventures allows you to walk through the tree tops and over a waterfall on a suspension bridge. Next take a short walk to our hidden treasure: an idyllic deep waterfall swimming pool. Enjoy lunch, swim, jump or just float around on inner tubes. The new addition to Princeville Ranch Adventures is the King Kong line. It is the longest zipline on Kauai. This Kauai zipline is a 1,200 ft long twin line! Grab a friend and zip side by side on the King Kong! Children age 16 or 17 can go on Princeville Ranch Adventures Kauai tours without an adult as long as a parent or legal guardian signs a liability waiver and physically checks in the child at our office. Zipline participants must be between 75–280 lbs, at least 10 years old, good physical condition with NO recent injury or surgery to feet, knees, ankles, hips or back.